The Albatross' use by leading Australian companies is an excellent example of its ability to be tailored to the individual needs of the end user. 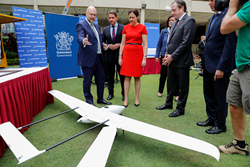 The Applied Aeronautics Albatross, equipped with technology from leading Queensland firms, was on display last week at the signing of a partnership between The Boeing Company and the Government of Queensland. Under the partnership, Queensland will become home to Boeings' largest robotics development program outside of the United States. This cooperation is expected to benefit local small businesses in the aerospace, manufacturing, defense and technology sectors. “In addition to being affordable, the Albatross was designed to be an entirely customizable platform. The Albatross' use by leading Australian companies is an excellent example of its ability to be tailored to the individual needs of the end user. This adaptability allows for the development of a truly unique UAV solution for applications ranging from research and public safety to mining and agriculture. We’re excited to see the Albatross used in this capacity in Queensland,” remarked Ryan Johnston, CEO of Applied Aeronautics.